Hans Selye was a twenty-eight-year-old assistant working in the Biochemistry Department at McGill University in 1934 in search of a new hormone and fame. He was encouraged when, after injecting rats with an extract from ovaries, they developed a wide range of symptoms. His initial elation of a great hormonal discovery turned to dejection when he observed the same findings after injecting a disparate range of other organ extracts. These results led him to recollect back fifteen years to his second-year medical student days at the University of Prague, when patients appeared with a wide range of symptoms that defied a simple diagnosis, that were general in nature, and that had no specific cause. EUSTRESS OR DISTRESS. In 1936, Selye, a Hungarian heritage Canadian endocrinologist, wrote his first paper in which he formulated the General Adaptation Syndrome (GAS). In it, he introduced, in a biological context, the term stress. Selye found this word difficult to succinctly define, nor could it be readily translated into other languages; when used by non-English speakers, it was commonly prefixed by el, il, lo, der, etc. Selye referred to stress as a “nonspecific response of the body to any demand, whether it is caused by, or results in, pleasant or unpleasant conditions.” Stress, then, could ensue from being terminated from a job or engaging in a hard-fought tennis match with a worthy opponent who is a best friend. Selye characterized the GAS as having three phases: During the initial phase of alarm, the animal recognizes a challenge and acts by a “fight or flight” response. The “stress hormones” are secreted: cortisol from the adrenal cortex, and adrenaline (epinephrine) from the adrenal medulla. This phase is followed by one of resistance, when the body attempts to restore normality, balance, and homeostasis. If the ability to resist is unsuccessful, the final phase of exhaustion ensues, which can lead to the depletion of the body’s energy resources and is most hazardous to health; problems such as stomach ulcers, heart disease, hypertension, and depression may be the consequence. Conversely, Selye argued, stress is not necessarily undesirable and should not be avoided. SEE ALSO: Homeostasis (1854), Negative Feedback (1885), Secretin: the First Hormone (1902), Neurotransmitters (1920), Hypothalamic-Pituitary Axis (1968). 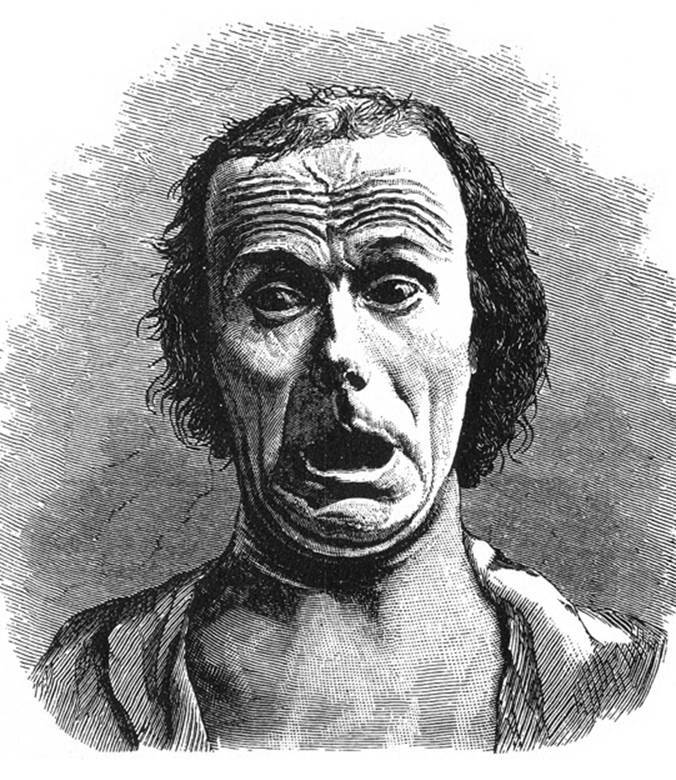 This terrified face, based on a photograph taken by the eminent French neurologist Duchenne de Boulogne (1806–1875), appeared in Charles Darwin’s 1872 book The Expressions of Emotions in Animals.